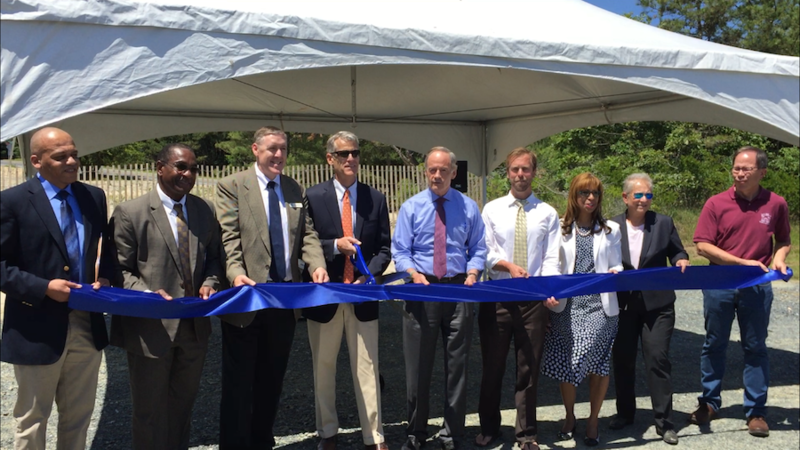 New Rehoboth Outfall Means Healthier Inland Bays! Rehoboth Beach – On Friday, June 15, officials and members of the community gathered to cut the ribbon and celebrate the completion of the City of Rehoboth Beach’s ocean outfall project. A win for the Inland Bays, this outfall will prevent over 17,000 lbs of nitrogen and 1,000 lbs of phosphorus from entering the Bays each year! Removing this discharge instantly stops an astonishing 17,000 pounds of nitrogen from being pumped directly into the Rehoboth Bay every year – that’s the equivalent of preventing the use of 3,400 50-lb bags of fertilizer (another source of excess nutrients) from being used on land within the watershed. It will also stop the contribution of over 1,000 pounds of phosphorus each year – removing the equivalent of 2,200 50-lb bags of fertilizer and an amount equal to over 30% of the annual phosphorus load to Rehoboth Bay.